Today we are going to talk a little about self care. Sometimes I get carried away, I can be a bit of a workaholic and find it really difficult to switch off, this can mean that I take on task after task and spend my entire day, morning to night, working on everything and anything that has come my way and then suddenly I realise weeks have gone by without me taking a break, yes weeks. I start to notice the tell tale signs that I've pushed too far yet again, the tight chest, the pains in my back, the feelings of anxiety or stress... That's usually the point when I remember I started watching a movie two and a half weeks ago, turned it off to catch up on something and I haven't actually stopped since then. A few years ago this would have been my cue to head to the town, burn off some stress walking miles around the shops and go home with a new lippie or two. Times have changed though and now I live a three hour round trip from the shops and when you factor in traffic near the city, parking and travel time it just isn't as relaxing as it once was, now I like to relax at home. 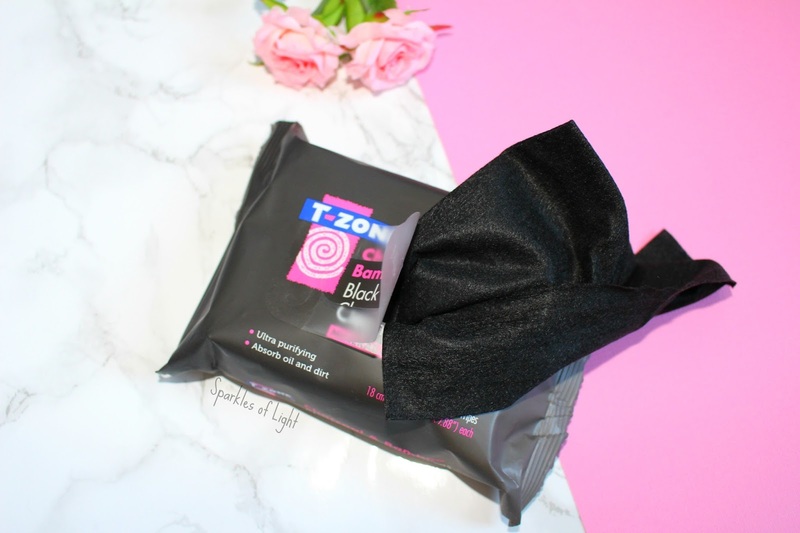 At the moment I have been using the T-Zone range that you can pick up at Superdrug, it's all really affordable and I am enjoying using the products. The cleansing wipes are amazing, like I've said, sometimes the end of the day arrives and I've not stopped for hours and I just can't be doing with a full cleanse, tone and moisturise and so (provided I've not had a full face of makeup on because I always do the full routine then) a quick wipe with these bad lads and I feel refreshed, also, they're black which is so unusual and I love something different. They have a light musky scent and don't leave any residue behind, job done and off to bed. I have been enjoying the face masks too, I'm trying to get more into face masks as I really want to look like I have the skin of a teenage girl even though my teen years are long gone but that's another story. These masks self heat and are activated by water so to use one I wet my face and squeeze the sachet into my hand then massage into my face, if I want the mask to be warmer I just add a little more water, as the mask is massaged in it keeps warming and after about a minute I rinse it all off and boom, clearer looking skin. The mask is designed to open pores and then the charcoal acts as a magnet to draw out dirt and impurities while the bamboo extract is there to control oil. Magic. My newest favourite tool in younger skin is the Sensse Anti-Ageing Facial Cleansing Brush and Exfoliator, if you know me you'll know that I love me some anti-ageing tools (read about the other device I'm using at the moment - The PMD Microderm) and you might also know if you follow me on twitter (@RosySparkles) that my beloved Magnitone Lucid died on me and therefore I needed a new cleaning brush and this one ticked all the boxes. 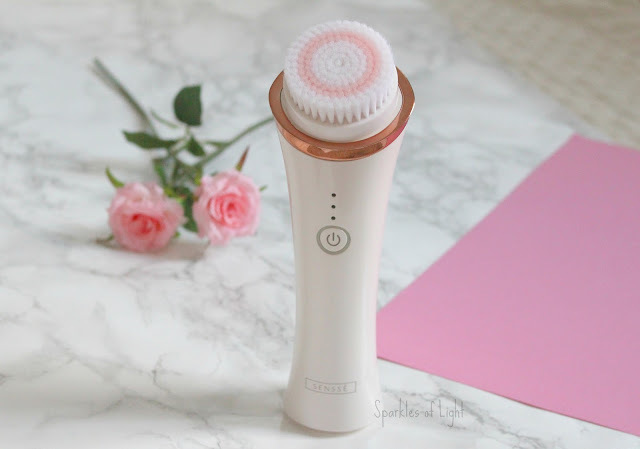 Apart from being beautiful to look at, the Sensse brush has three speeds so that you can set your intensity, the first setting is for sensitive skin (moi) and then goes up to a higher level for deep exfoliation and anti-wrinkle treatment. 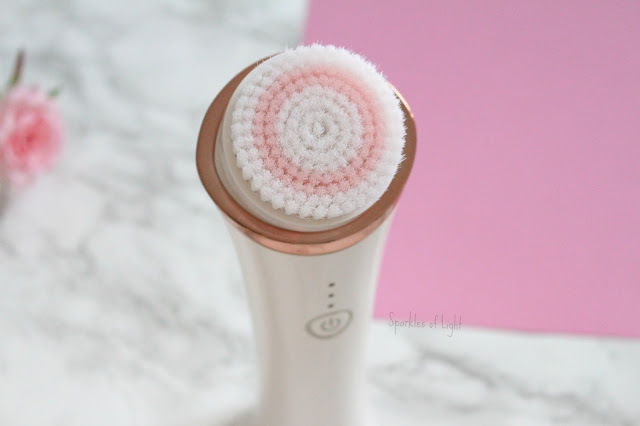 The bristles are designed to massage the skin to stimulate collagen and elastin production, which as you probably know, are two of the vital components in reducing fine lines and wrinkles, I have high hopes for this one! Oh and it also has a built in battery that is supposed to last 60 uses, so you don't have to charge it each time, perfect. I've been using the Sensse with the facial scrub from T-Zone which is designed the same sort of way as the face packs with the Charcoal to draw out imperfections and the bamboo to keep oil at bay or my Liz Earle cleanser because I love me some Liz Earle. The T-Zone range are mineral oil free and purifying and I can't wait to try more from the range. 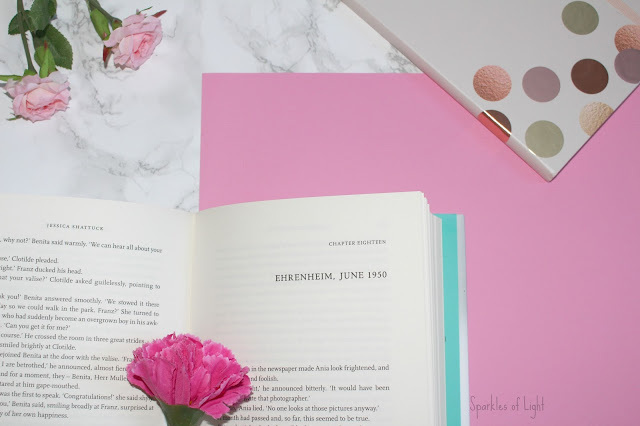 After all of this I do like to just settle down with clean skin, hair in a messy bun, a good book and a glass of wine (or a cup of tea if it isn't wine o'clock, you don't have to stage an intervention!) and after a few hours I start to feel human again, then I check all my emails and start again the next day back on the rollercoaster trying to remember to take a breath! The face mask sounds lovely! I'm a sucker for anything charcoal haha. My pampering involves a lot of Netflix and some skincare pampering as well! I love a good bit of netflix too! So important to put yourself first! I need to do this more often haha! The products sounds amazing and it really is important to give yourself some time to just rest and do things for yourself! Thanks for the introduction to TZone! I didn't know anything about them. Really enjoyed this post! I love a good pamper to unwind! I really need a cleansing brush in my life and this one looks super cute! That mask sounds amazing, I want to try it! I love that you can get those at Superdrug!! 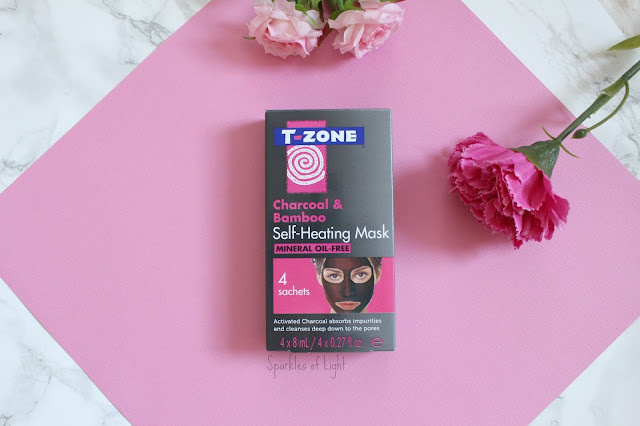 I'll definitely be trying the T-zone mask. Good for you for knowing when to hit pause... I could use some help with that!! I am getting better and better at it these days haha. 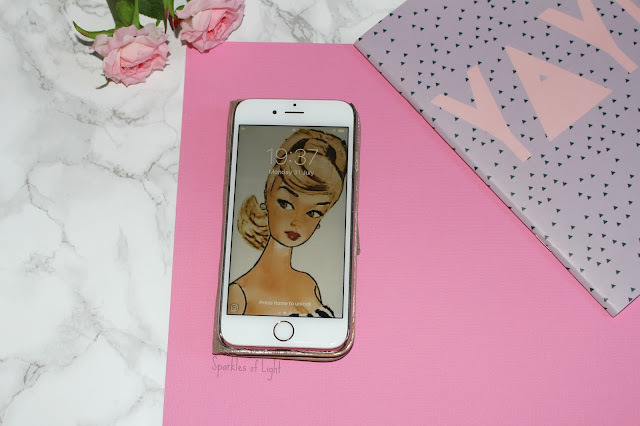 I'm glad you're scheduling in some down time to relax and rest - even if it's only for a few minutes to have a bit of a pamper routine! IT's too easy to get caught up with everything that needs done but we really do so much better when we relax and recharge when needed! I agree so much, I was working way too hard for a while. This was 100% me all of the time. The wipes sound amazing, I love a bit of a pamper session to cheer you up! I loved the fact they were black, it seemed luxurious somehow. It's a serious issue isn't it! Such an important post Rosy. Somedays I really have a hard time turning on and off work mode. Its like a part of who I am sometimes, I hate it. I try to read a book everyday and make that time for me or I make time in for a face mask or some extra pampering. Love your tips! I'm glad to hear you're managing to take some time out to read and pamper! Similarly to you, I'm trying to prioritise self-care over everything else because without it, everything else will eventually crumble! I love a good face mask and one that's self heating!? I'm there! I haven't tried any of these products but I would absolutely love to, they look incredible. I love the black face wipes, they're so intriguing. I have annoying blackheads, so I think I need to try out something with charcoal in it because it's said to be so good. I'm just like you when it comes to being a workaholic and forgetting to rest. Those wipes look incredible, maybe I'll give them a try! I really need to get more into my nails. Phones are such a distraction! I can totally relate to this post, as I have a habit of taking on too much, and the back pains and feelings of anxiety are very familiar! I think we all need to take some time out for pampering from time to time! A mask is always a good idea and I love the look of the cleansing and exfoliating brush too! It's amazing how many of us are overworking ourselves! Definitely take more time for yourself! Airplane mode is such a lifesaver when you're stressed. Especially at night when you should power down and focus on reading a good book and catching some zzz's. Sometimes some deep relaxation is needed. With technology constantly in hand, it's hard to have time off. Switching off my wifi on my phone or logging out of all my social media works really well for me! It's so important to take care of your well being Rosy! I'm glad that you spoilt yourself! Without relaxation I quickly get too stressed. Lovely post! You're so right about needing time to yourself - it's crazy how easy it is to forget that. Those products also look fab! I usually reserve my Sunday afternoons to relax with a face mask. It's great for my skin and helps me zone out a bit too since I can't technically do much with a mask on. I've tried the pore strips before and wasn't that impressed. I keep hearing about the heated mask though and I really fancy giving that a try. I'm currently trying another cleansing tools from the sensse range and it's going great so far! It was definitely the novelty of having black wipes that drew me in, I love something a bit different. I can so relate to this! I relax by using face masks and listening to music. Lately I haven't been so chill though since it's Game of thrones season hahaha! such an interesting and useful post! Thanks for sharing! It's so important to make time for this, I agree! I have been using the TZone range and enjoying it, especially the heat activated mask.